I started Lord of the Rings Online once, and spent a few properly joyful hours delivering mail around Hobbiton. It was a bit like Assassin’s Creed III, in that my best memories are of vaulting fences on foot at 30mph. Whee! Once I saw a high level character passing through from the barrows to the badlands, who halted his steed just long enough that I could take in his ornate armour and particle-affected weaponry. Like Frodo, I knew that I was meeting beings I couldn’t possibly match for strength or power. Maybe I can, now. For during the month-long run-up to LOTRO’s have-they-really-not-done-this-one-yet Helm’s Deep expansion, Turbine have decreed there’ll be double XP for all. Turbine have a similar issue to Blizzard, in that they need to find a way to funnel new players through to their spectacular endgame content. Their solutions are necessarily different, however: World of Warcraft’s lifeblood is its torrent of subscription cash, so it makes sense to lavish all but its latest expansion upon subscribers for no extra cost beyond the basic edition. Turbine, by contrast, were the first major MMO developers to wholeheartedly embrace free-to-play. Expansion sales are at the core of their business, and so it follows that speeding levelling for their players will lead to a better launch for their latest. 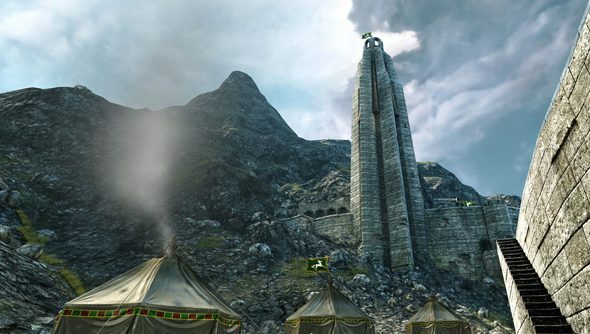 Lord of the Rings Online: Helm’s Deep will raise the level cap from 85 to 95, but any player above level 10 can become a footsoldier in the fight against Saruman (though you can bet not directly – he’s one of those impossibly powerful beings we were talking about). For an alternate approach, look at SOE, who’ve taken a more direct route to a boosted endgame population with one of their ageing MMOs. New EverQuest 2 Heroic Characters allow players to skip the first 85 levels of the game and have their first bite be the juiciest, for a price. Will this be enough to tempt you back to Middle-Earth? I can’t imagine you’ve never visited the place before, in some form.